Apitherapy, or healing with bee pollen is an ages old treatment. In fact, bee pollen therapy was mentioned in the Bible, as well as in other ancient Chinese and Egyptian texts. 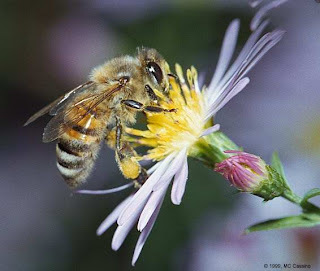 Bee pollen actually contains all the essential components of life. It counteracts the effects of our modern day custom of consuming diets which are deficient or unbalanced nutritionally. One of the many uses of bee pollen is in a weight control or weight stabilization program. Because of it’s ability to correct chemical imbalances in body metabolism, it can normalize or stabilize weight gain or loss. It is a low-calorie food, containing only ninety calories per ounce. Bee pollen contains lecithin, which helps to dissolve and flush fat from the body. This is also useful for cholesterol balancing by lowering the level of low-density or bad lipoproteins, while increasing the helpful high- density lipoproteins, which in turn protect the body from high cholesterol levels and heart disease. Bee pollen also eliminates craving by increasing the value of each nutrient in the food you consume. Phenylalanine is a natural amino acid that the body requires for appetite suppression, by acting on your appestat, which is the control center of the body that signals fullness and hunger. Phenylalanine works naturally with the body, exerting an appetite suppressant if you are overweight, maintaining your weight if you are just right, and actually increasing the appetite if you need to gain weight, unlike the manmade version of this amino acid, phenylpropanolamine, which decreases the appetite no matter if you are thin, overweight or just right. Phenylpropanolamine can also cause jitters and become addictive. Phenylpropanolamine also should not be taken by persons with thyroid problems or high blood pressure. Bee Pollen has also been found effective in treating thousands of other diseases, conditions, and also as a preventive part of a wellness program. The best website I have seen on the subject is Shirleys Wellness Cafe. Be sure to check it out. Anyone who has allergies to pollen or bees should check with a health care provider before ingesting bee pollen. Bee pollen should not be given to infants under any circumstances, as honey can be toxic to their systems. I am not a doctor, and do not sanction any of the treatments or medicines that I write about. The articles are meant to be informative and thought provoking, and not construed as medical advice.